Here in the Pacific Northwest, we know a thing or two about rain. From months of daily drizzle to heavy downpour in the mountains, we’re acutely aware of the benefits of a quality waterproof and breathable jacket. The 2019 rain jackets for men and women below range in price from $60 to over $400, but all have what it takes to perform well in a rainstorm: good seam sealing, a DWR coating, and a secure hood. Entry-level rain jackets won’t last as long but are considerably cheaper. The pricier options fall into two categories: sturdy shells that can withstand driving rains and snowfall, and ultralight minimalist pieces for backpacking, climbing, and trail running. For more information, see our rain jacket comparison table and buying advice below the picks. What we like: High quality feel, great design. What we don’t: No stuff sack/pocket, heavy. 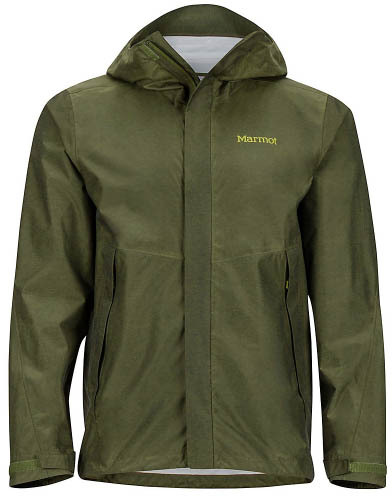 For a versatile rain jacket that can worn just about anywhere, our top pick for 2019 is the Marmot Minimalist. The difference in quality when compared with entry-level rain jackets immediately is apparent. 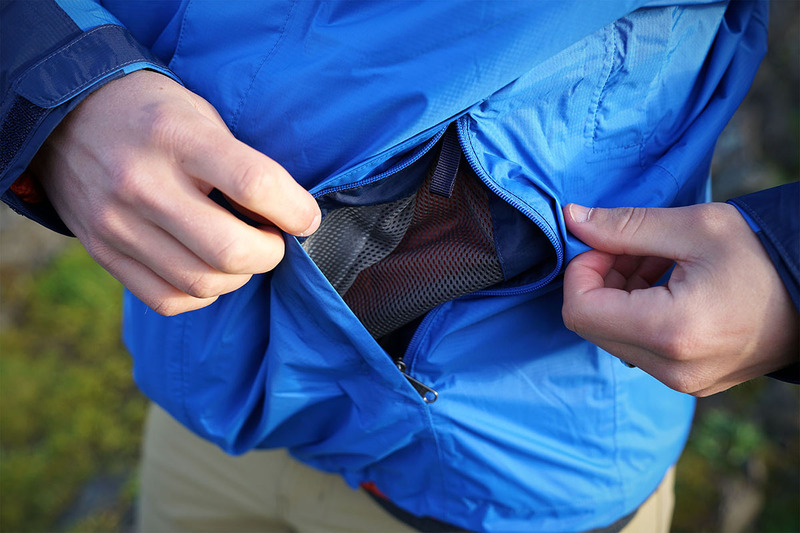 The lining of the shell is less plasticky and doesn’t feel as clammy if you start to get warm while walking or hiking. The hood is nice and thick and comes with a substantial bill that can withstand heavy rain and wind. And just about all of the features have a premium and trustworthy feel, from the burly and confidence-inspiring zippers to the thick cinch cord and easy-to-use toggles at the hem and hood. It’s worth noting that Gore-Tex’s Paclite waterproof laminate, a proven winner for jackets in this category, has been updated to include a 100-percent recycled face fabric. What we like: Premium feel and feature set. What we don’t: The OR Interstellar below is slightly more mountain ready. REI’s in-house line of rain shells takes another major step forward with the release of the Drypoint GTX. Most notably, REI has partnered with waterproofing powerhouse Gore-Tex (we liked the eVent used in the old Rhyolite jacket, but it’s hard to argue against Gore-Tex Active). All in all, the Drypoint has a premium look and feel, a supple interior that doesn’t get clammy, and ample features including core zips integrated into the mesh-lined hand pockets and easy-to-use hood and cuff adjustments. What we like: Great value, breathes well for the price, quality materials. What we don’t: Limited hood adjustments. 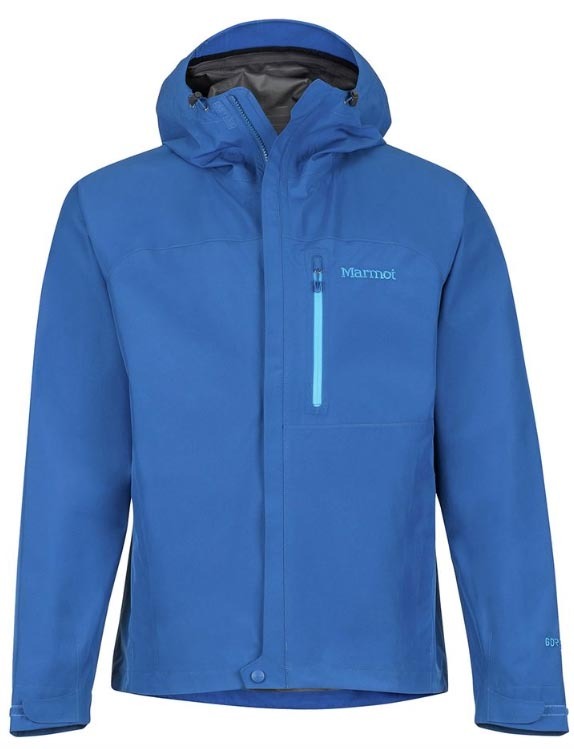 In the world of rain jackets, Marmot just seems to get it, delivering good fit and performance at reasonable price points. The PreCip is their leading entry-level offering and is all the jacket the daily wearer and occasional backpacker needs. In fact, it's the jacket we recommend to friends and family the most. A big contributor to the PreCip’s popularity is its light feel and feature set. Pit zips and Marmot’s proprietary waterproof coating are effective tools in keeping you comfortable in all but a serious downpour. A design feature unique to the PreCip is its hood, the base of which attaches directly to the shoulders rather than the collar. If you want the hood up but don’t want to zip the entire jacket, this design means you don’t have to deal with an annoying open and loose collar. It’s also a cinch to roll up and store the hood when you don’t need it. We would prefer if the hood itself had a better fit around the head: the cinch cord doesn’t reach the top of the bill, only pulling in at the sides, so you don’t get as good of a seal across the forehead. What we like: Soft on the inside yet burly on the outside. What we don’t: Heavy and bulky. 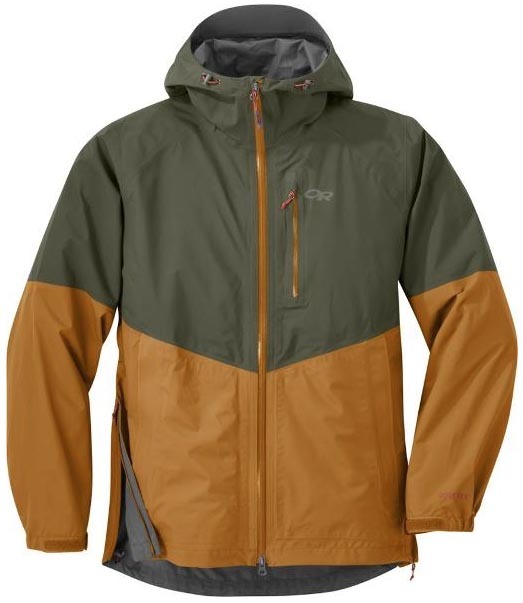 Many rain jackets are lightweight and minimalist in nature with backcountry use in mind. At 25.6 ounces, The North Face Apex Flex 3.0 is by far the heaviest jacket on this list but a solid option for everyday use and hiking when weight isn’t a concern. Most importantly, the jacket has a thick softshell-like feel but with 3-layer Gore-Tex protection, meaning that it blocks wind, will keep you dry, and even adds a little warmth. The knit interior is super soft to the touch, making the jacket comfortable over a t-shirt, but the exterior is all business. In terms of features, the Apex Flex 3.0 is fully loaded. You get three pockets, a large hood that cinches securely in back, pit zips for ventilation, and Velcro cuffs. 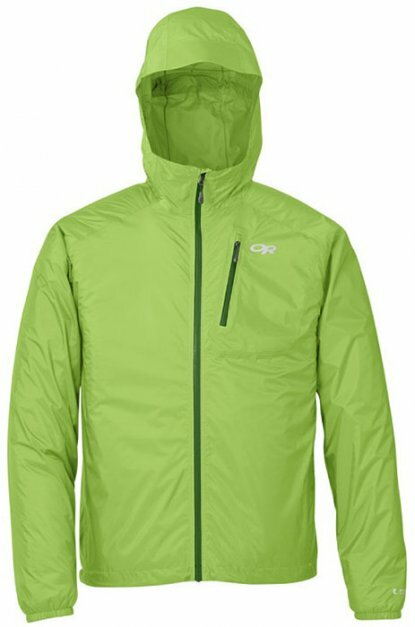 Again, this jacket is many times heavier than some of the ultralight options on this list and doesn’t pack down nearly as small, but it’s a great option for urban use and leisurely outdoor trips. For a more affordable alternative, check out the $199 Apex Flex DryVent that trades the Gore-Tex membrane for an in-house design. 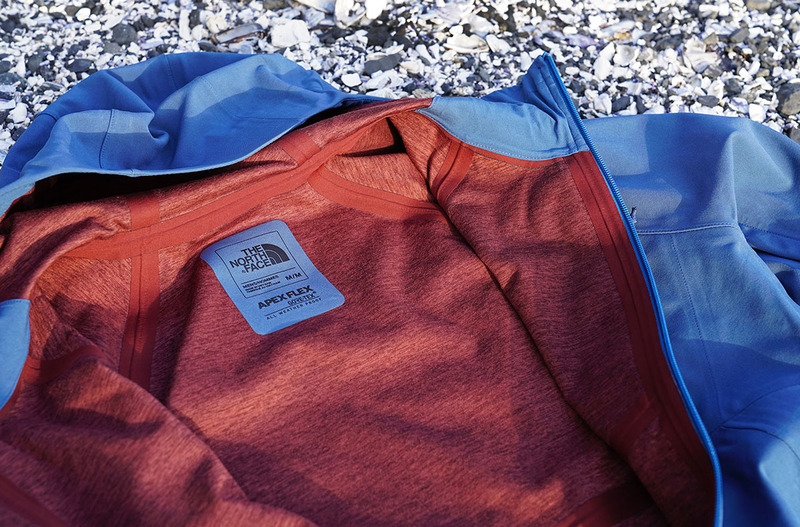 What we like: Super light and packable. What we don’t: Doesn’t breathe as well, clammy-prone interior. The seasoned veteran of the ultralight category, the Outdoor Research Helium II is a super light and packable minimalist shell. Weighing just 6.4 ounces and with surprisingly good rain and wind protection from its Pertex waterproof build, the Helium is a long-time favorite for lightweight hiking and backpacking, climbing, and mountain biking. Feature-wise, it’s pretty minimal. You get one Napoleon chest pocket (no hand pockets), a simple water-resistant main zip, and a single-pull hood adjustment. We think the jacket is basic to a fault for urban/everyday use, but its real performance chops come out in the backcountry. The Helium II stuffs easily into its small interior pocket and is compact enough that you really have no excuse for leaving it behind. Having been around for a number of years, the OR Helium II does show its age a bit when compared with a newer option like Arc'teryx's Zeta FL. Although waterproof, Outdoor Research’s 2.5-layer design is not very breathable and you don’t get pit zips or pocket venting options. The jacket excels for emergency use in a surprise squall, but it’s prone to feeling clammy while on the go for extended periods. If price is no object, we’d lean toward the more breathable and durable $325 Zeta, but considering the significant cost savings, the Helium II gets the nod as our favorite ultralight option. What we like: Premium look and feel; excellent feature set. What we don’t: High price and 2-layer build. 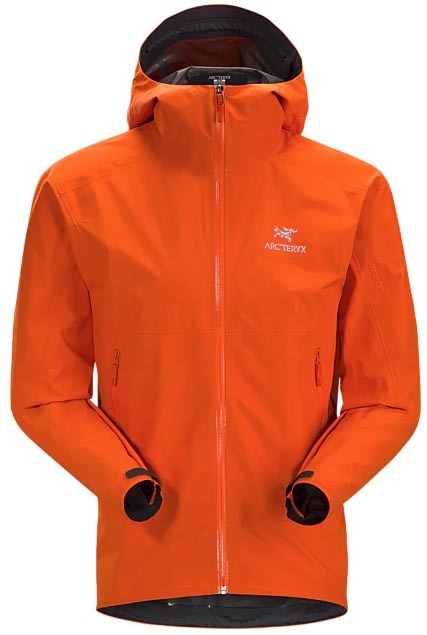 Arc’teryx is known for top-of-line quality and prices to match, and we were excited to see a new rain jacket in their lineup for 2019 (for reference, the older Zeta LT at $425 was out of reach for many people). The Zeta SL is the whole package: it’s reasonably light at 10.9 ounces, packs down small, is super comfortable against the skin, and has a tough 40-denier shell that can stand up to a lot of use and abuse. In addition, it looks great and can be worn for everything from hiking to commuting in the city. We’ve worn this jacket throughout many a rainstorm in the Pacific Northwest and while winter backpacking in the Grand Canyon and have come away impressed. What are the downsides of the Arc’teryx Zeta SL? The 2-layer design means that it doesn’t breathe quite as well as many of the more performance-oriented jackets on this list, although Gore’s Paclite Plus has been solid in our testing. And at this price, you can get the 3-layer REI Drypoint above and save $50 in the process, although you do sacrifice durability (the REI is 20D). But for hiking and everyday use, you’ll be hard-pressed to find a better-looking or more comfortable rain jacket. And for those looking for a more backcountry-specific piece, Arc’teryx also released the Zeta FL, which is lighter at 7.2 ounces, thinner at 20D, and costs $325. ​What we like: Small packed size, great hood, weather-ready construction. What we don’t: Has a heavier feel when worn, price premium. 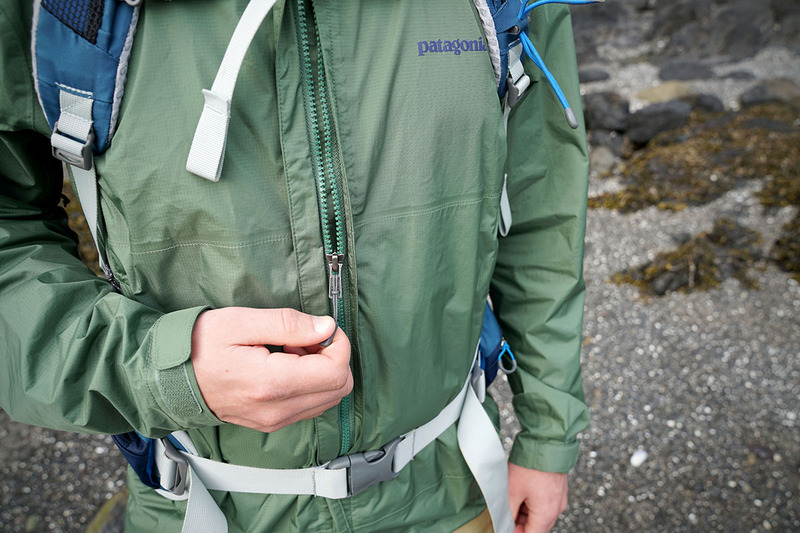 Sharing a lot in common with the Marmot PreCip, the Patagonia Torrentshell is differentiated by a few extra features and a higher price tag. To start, you get an even fit around the hem thanks to a drawcord at each side, and a streamlined flap that doesn’t require any Velcro covers the center zipper (make sure it's covering the zipper or else water will seep through). Striking us as clean and functional, the whole look plays well for daily wear. The extra money also brings a bit more of a substantial fabric feel that is apparent in use, despite weighing less than an ounce more. We weren’t completely sold that a lightweight jacket such as the Torrentshell should feel so heavy, but its more substantial construction does come in handy if the weather turns particularly nasty. And if it does, the Torrentshell has the best hood design of our entry-level options. A single cinch at the back of the hood adjusts around the sides and back of the head as well as the bill, creating a good fit and seal. It’s a simple and effective system that we wish was universally adopted. What we like: A bomber multi-sport shell at just 11 ounces. What we don’t: Not everyone will appreciate the technical design, including the helmet-compatible hood. 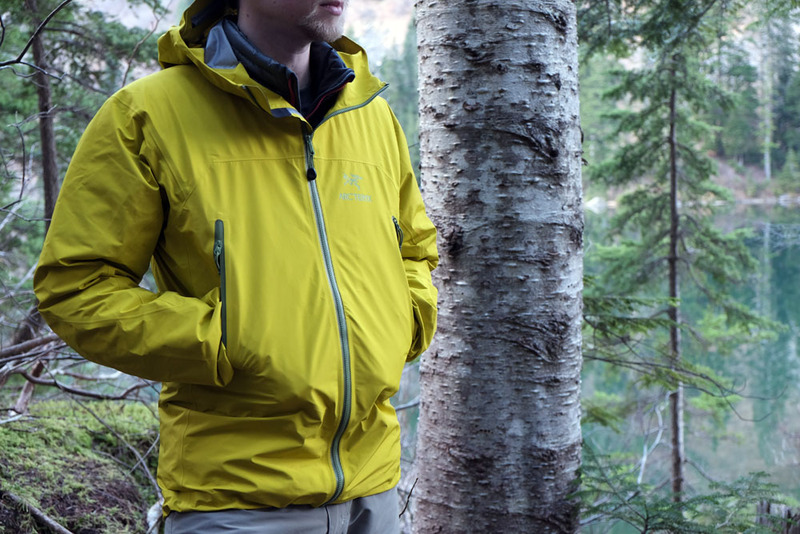 Last year, Outdoor Research replaced their excellent Realm jacket with the Interstellar. Despite the name change, this is a very familiar piece: you get OR’s proprietary AscentShell membrane, which is stretchy, breathable, and highly waterproof. 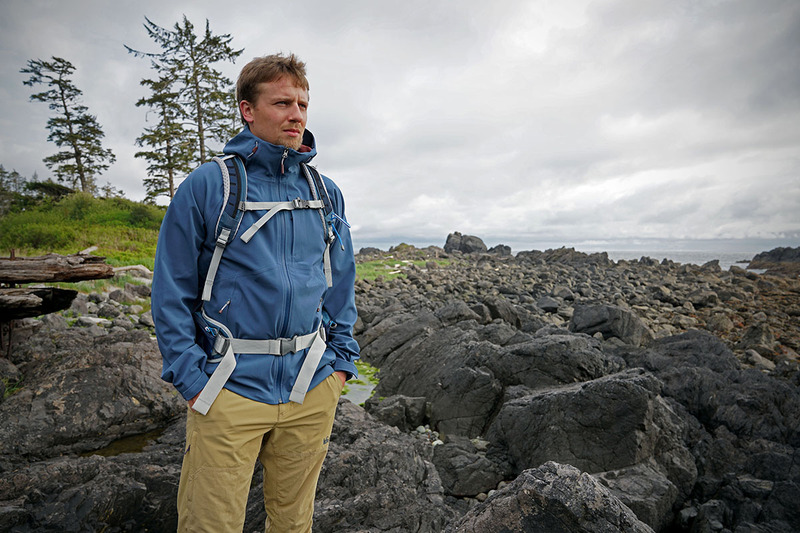 The 20-denier face fabric is lightweight and packable, and the jacket has multi-sport features like a helmet-compatible hood and harness-friendly pockets. For everything from backpacking and mountain biking to backcountry skiing, the Interstellar is a great option. Notably, the Interstellar is available in both men’s and women’s designs (the old Realm wasn’t made in women’s sizes). Outdoor Research worked to make the Interstellar more everyday friendly by adding hand pockets, but keep in mind that this still is a performance-oriented piece. For casual wear or hiking, the helmet-compatible hood is large and unnecessary, and the jacket has a more technical look than the REI Drypoint above. That said, the Interstellar is one of our favorite rain jackets for seriously rough conditions. What we like: Excellent price for a Gore-Tex shell. What we don’t: It can’t match the everyday appeal of the Marmot Minimalist above. REI Co-op’s follow-up to the impressive Drypoint above is the new XeroDry GTX. 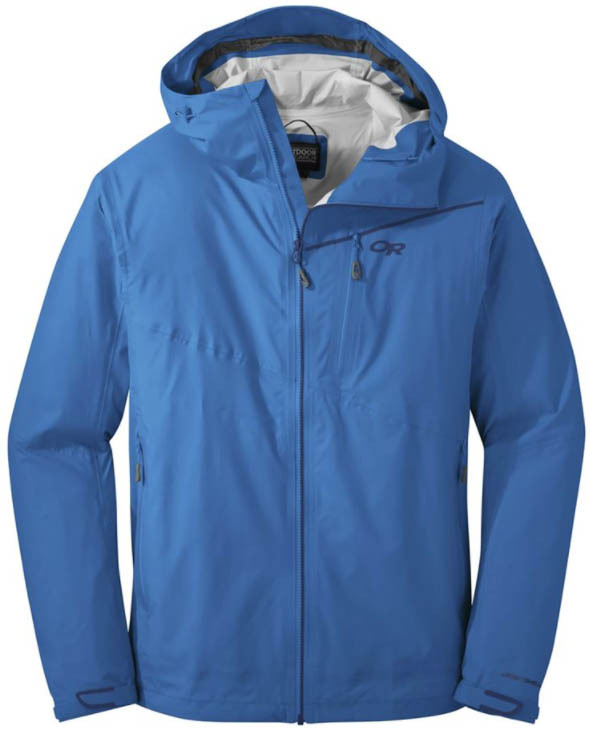 As the name indicates, it’s another Gore-Tex product, but in this case the jacket features Gore’s minimalist Paclite construction. The 2-layer build helps keep weight in check at 12.5 ounces without compromising on useful features like two hand pockets, a chest pocket, adjustable cuffs, and a helmet-compatible hood. In terms of wet weather protection, the jacket is a step up from thinner designs like the Patagonia Torrentshell above, but is more prone to wetting out than the 3-layer Drypoint in extended downpours. All told, the XeroDry is a nice option for anything from daily commutes to hiking adventures. What we like: Stretchy, loaded with features, and affordable. What we don’t: Large fit doesn’t match its performance intent. 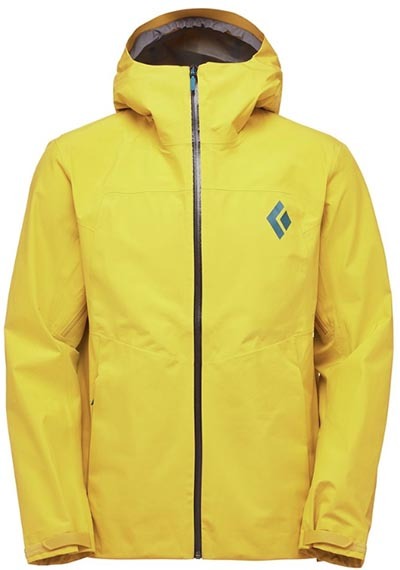 Black Diamond has taken the plunge into the rain shell market with the all-new StormLine. The big news is the stretchy 2.5-layer construction, which offers greater comfort than a standard rain jacket like the Torrentshell above. The interior is soft to the touch and doesn’t have the plasticky feel that you get with the Patagonia, and there’s a noticeable amount of “give” in the shell fabric. The jacket also is well-equipped and competitively lightweight with two hand pockets, a coated front zipper, and an all-in weight of 10 ounces (for our men’s medium). To top it off, the StormLine is aggressively priced at $149. Features like a helmet-compatible hood, stuff pocket, and pit zips give the StormLine a clear performance slant, but the large fit isn’t ideal for the backcountry. It’s easy to layer a puffy underneath, but the jacket was much too long and roomy for us when wearing it over a thin baselayer. 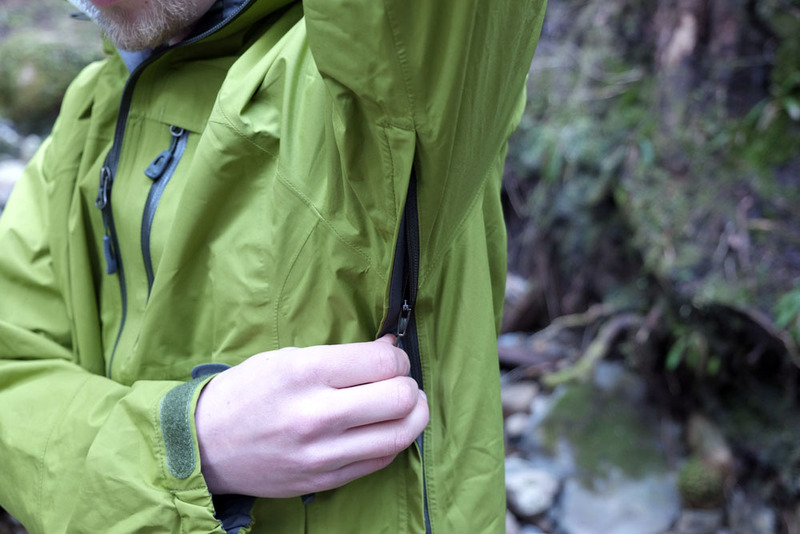 We found that BD’s 2-ounce-lighter FineLine jacket has a more athletic cut, but that model gives up valuable features like hand pockets, adjustable cuffs, and pit zips. What we like: Multi-sport functionality, nice fit and feel. What we don’t: Annoying toggles and pricier than the Marmot Minimalist. We love what Outdoor Research has done with the Foray: a do-it-all rain jacket that can even work as a lightweight shell for spring skiing. Like the Marmot Minimalist above, it has a Gore-Tex Paclite waterproof laminate and smooth interior, but the Foray ditches the center flap in lieu of a water-resistant zipper. The jacket’s truly unique feature is its full-length side zips that extend the standard pit zips all the way to the bottom hem. 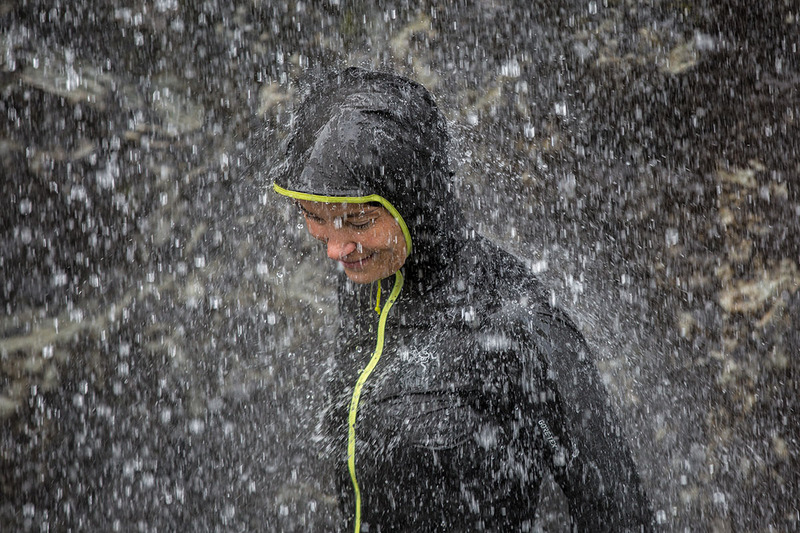 When fully unzipped, this creates a poncho-like opening for awesome venting on the trail—a great way to dump excess heat while still retaining a mostly waterproof coverage. We like the large hood and how well it cinches down, but aren’t crazy about the single drawcord toggle on the back of the hood. It’s difficult to pinch, making loosening the hood a pain. What we like: Light and packable with great stretchiness. What we don’t: Pricier than the BD StormLine above. 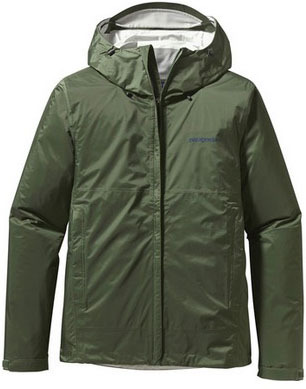 Taking the place of the discontinued Alpine Houdini as Patagonia’s go-to alpine rain shell is the Stretch Rainshadow. While not an all-new design, the jacket has been updated for 2019 with a 100-percent-recycled face fabric, new colorways, and some slight tweaks to the look. 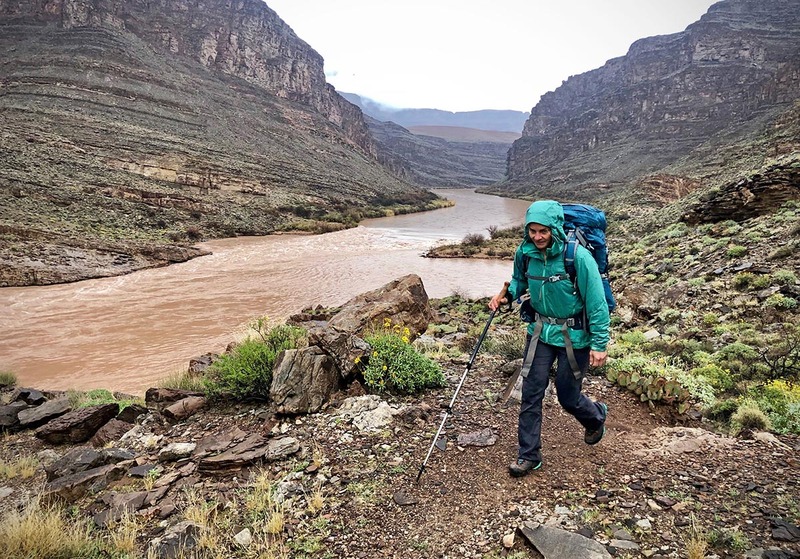 We tested the jacket on a winter backpacking trip in the Grand Canyon and enjoyed the extra “give” in the material, although it wetted out fairly quickly in a heavy rainstorm (our layers underneath did remain dry, however). And as we’ve come to expect from Patagonia, the Rainshadow’s fit and finish is excellent and its styling crosses over very nicely for daily wear. With a 2.5-layer, stretchy construction and good packability, the Rainshadow goes head-to-head with Black Diamond’s StormLine above. The two jackets have a lot in common, including pit zips, helmet-compatible hoods, and integrated stuff pockets with carabiner loops for attaching to a climbing harness. The Patagonia is a little more feature-rich overall with a chest pocket and water-resistant zippers on the hand pockets. But the BD is lighter by nearly an ounce and saves you a significant $50. It’s a close call between the two, but the StormLine’s price advantage is what gives it the slight edge for us. What we like: Quality 3-layer construction at under $150. What we don’t: The 20-denier shell isn’t very durable. Serious climbers love Montbell, and for good reason: the company offers well-thought-out technical pieces that come in cheaper than brands like Arc’teryx. At just under 10 ounces, the Rain Trekker is true to its name: you get reliable wet-weather protection along with hiking-centric features. It includes Montbell’s 3-layer Dry-Tec construction—impressive considering most rain jackets at this price use less breathable 2.5-layer designs—pit zips for dumping heat, and adjustable cuffs for getting a good seal around the wrists. 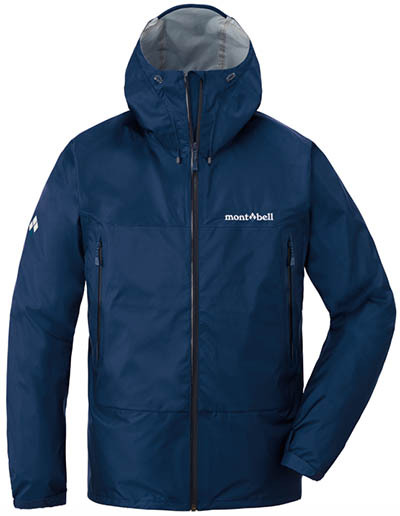 We also like Montbell’s fit, which is not too tight or too baggy and therefore works well both for performance and casual use. Our main concern with the Rain Trekker is its thin construction. At 20 denier, the shell isn’t Montbell’s thinnest—many of their ultralight puffies and rain jackets are 10D or 12D—but it still will require extra care around branches and other sharp objects or gear. For reference, the Torrentshell above has a 50D shell and only weighs an additional 1.4 ounces. The Rain Trekker’s durability concerns push it a little down our list, but lightweight trekkers that want to stick to a budget should be very pleased with Montbell’s effort. What we like: Another versatile rain jacket for under $100. What we don’t: Falls a little short in hood design and zipper quality. 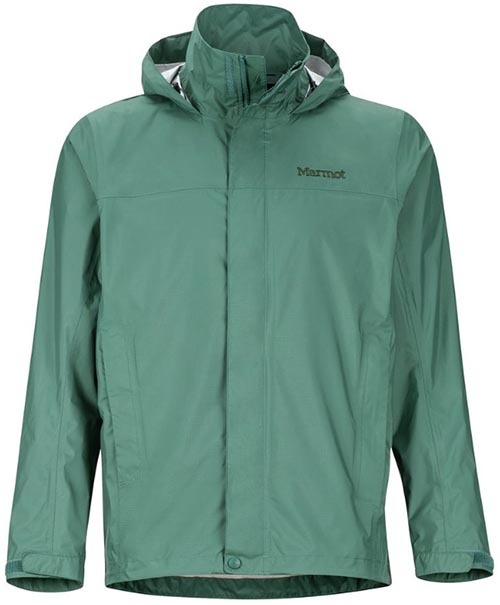 The $100 price range is crowded for rain jackets, including the Marmot PreCip and Patagonia Torrentshell above. 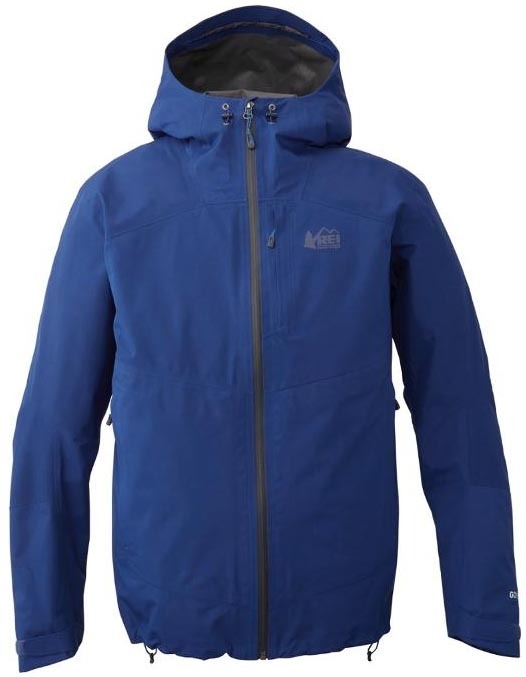 All are fairly similar in specs and build, with the updated Venture 2 from The North Face featuring a 2.5-layer DryVent construction, pit zips for ventilation, and an adjustable hood. The old Venture was an extremely popular hybrid rain jacket for daily use and hiking, and the “2” retains many of the same qualities. Why do we have The North Face Venture 2 ranked here? To start, it has our least favorite hood design among its competitors with less coverage at the top of the head due to its flimsy bill. Second, the main zipper has a coil design that lacks the smooth, confidence-inspiring action of the Patagonia and Marmot. Finally, we've had consistent issues with the jacket wetting out fairly quickly in heavy rainfall (it's also slow to dry). Despite our complaints, the Venture 2 is still a solid emergency shell and a step in the right direction from the old Venture, which we found to be very cheaply made. What we like: Typical Marmot quality and sustainably built. What we don’t: Less versatile than the slightly more expensive Minimalist. The third Marmot rain jacket to make our round-up is one of the company’s latest creation: the Phoenix. This shell was built with an eco-friendly ethos: its fabrics are sustainably sourced, the DWR coating is PFC-free and integrated into the shell, and there’s been a strong focus to minimize the use of chemicals and excess water in the manufacturing process. Importantly, the rest of the jacket is up to Marmot’s typical standards. The Phoenix is well made, fits comfortably with layers or just over a t-shirt, and offers precise adjustments at the cuffs, hood, and hem. What pushes the Marmot Phoenix down our list is value. 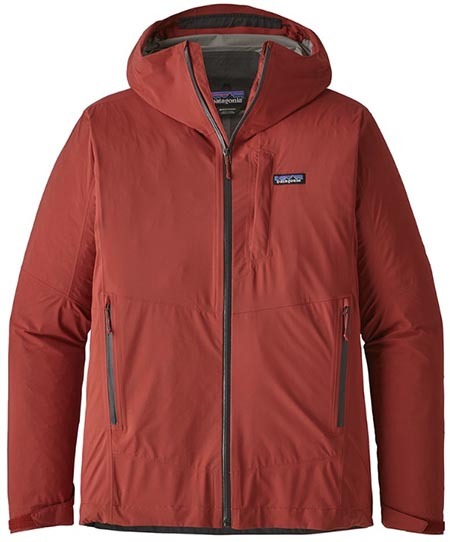 At $175, the jacket is nearly as expensive as Marmot’s Minimalist above but can’t match that Gore-Tex shell’s very solid wind and rain protection (it is a step up from Marmot’s PreCip in this respect, however). Further, the Phoenix doesn’t come with pit zips and is missing features that we expect at this price point like water-resistant zippers. Overall, there’s a lot to like about the new Phoenix, and it certainly would move up our list with a drop in price. What we like: Great fit and proven Gore-Tex performance. What we don’t: Pricey and the helmet-compatible hood isn’t ideal for hiking and everyday use. Black Diamond has come on strong lately with an impressive lineup of outdoor apparel. The Liquid Point is their leading performance rain jacket, and what we love about this Gore-Tex Paclite shell is its athletic fit: it’s roomy enough for layering but avoids the boxy feel of many standard rain jackets. As such, it’s one of the best options for those that want a shell for foul weather climbing, hiking, and skiing. An added bonus: the clean design of the Liquid Point looks great both on the trail and around town. Among the four rain jackets on this list made with standard Gore-Tex Paclite (the Marmot Minimalist, REI XeroDry, and Outdoor Research Foray above), the Liquid Point falls to the bottom because of its climbing focus and steep price. 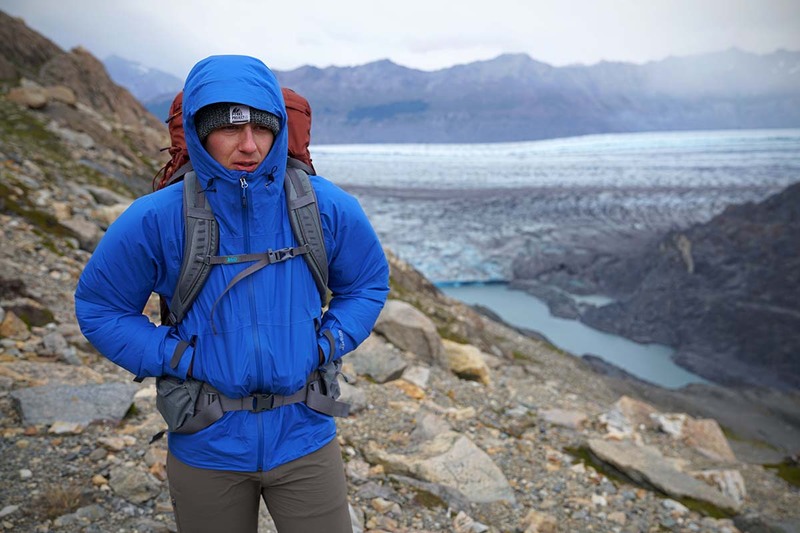 The very large hood that fits nicely over a climbing helmet can be cumbersome for everyday use and hiking, and the overall design is a little more streamlined than the Foray or Minimalist with only two hand pockets (the other jackets come with a total of three pockets). The upside is that the Liquid Point undercuts the Foray and Minimalist in weight. This is great for stuffing into a pack, and if the price weren’t such a big jump from the other Paclite jackets above, we would be inclined to give it a boost in our rankings. 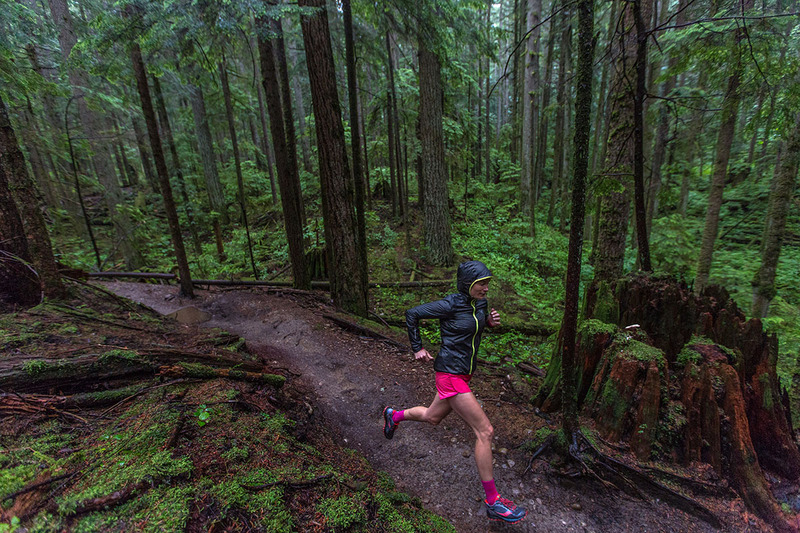 What we like: The premier rain jacket for trail running. What we don’t: Limited durability—the fabric is too thin for any kind of abuse. 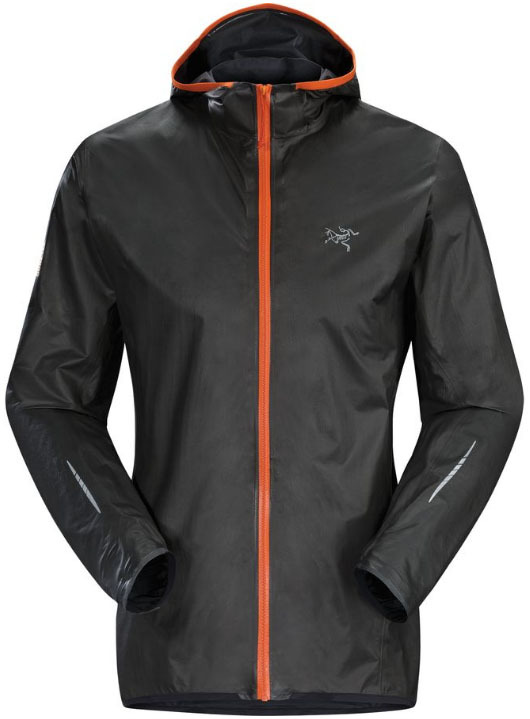 Arc'teryx's Norvan SL is billed as the lightest and most breathable waterproof shell available. This minimalist piece weighs around 4 ounces depending on the size, packs down to almost nothing, and is designed with trail running squarely in mind. 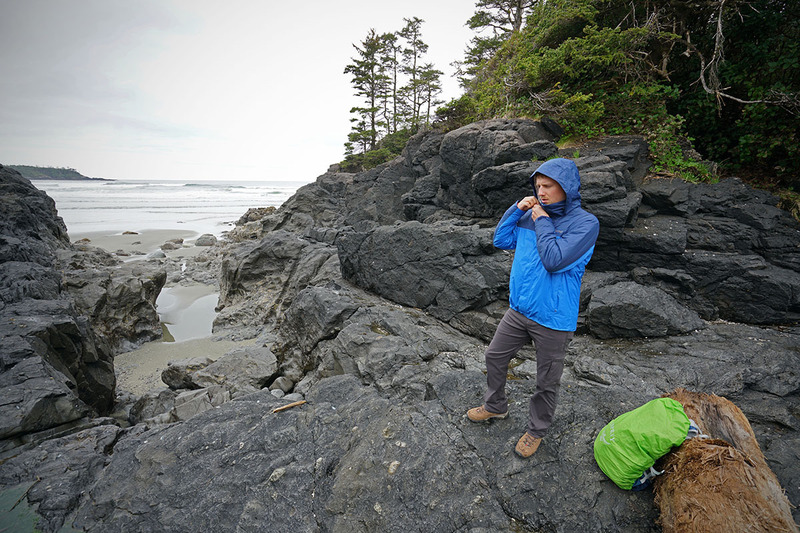 Upon testing it in the wet conditions of British Columbia, we were surprised at just how waterproof this tiny jacket is (we literally stood under a waterfall and can confirm that the jacket truly is waterproof). In addition, it does not absorb water and therefore will not get heavier when wet, a rarity in the rain jacket world. What we like: Great value, lots of color options. What we don’t: Cheaper 2-layer waterproof construction; doesn’t vent well. Priced at $59, and often available on discount, our most budget-friendly jacket to make the cut is the Columbia Watertight II. And while it doesn’t stack up as well in performance testing, good seam taping and a reliable build makes the Watertight II a solid option for daily use or as a just-in-case jacket you bring along when bad weather isn’t in the forecast. To start, it’s the only jacket constructed with a cheaper 2-layer waterproofing fabric, meaning it’s the only one with a hanging mesh interior. This adds bulk, and while the mesh has a softer touch, some do not like the feel against their skin. The fit comes in pretty average, with a nice and long back length, but the jacket does have more of a trim cut, so those that consistently throw on a thicker mid layer may need to size up. Large hand pockets are mesh lined, and because the jacket lacks pit zips, unzipping the pockets is the only form of ventilation. The warmer feeling interior thus does not make the Watertight II a great option for high output activities, such as a quick peak summit. 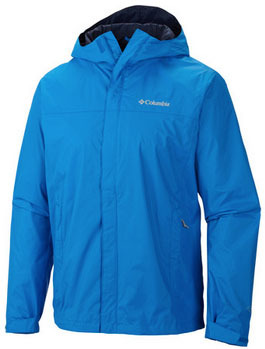 Overall, the look is very clean, and Columbia offers the jacket in a number of color options. For the casual user, it’s all the jacket you need. Editor's Note: "Packable" indicates the jacket has a stuff pocket. This is the most common type of lightweight rain jacket, and includes big sellers like the entry-level Patagonia Torrentshell and Marmot PreCip all the way up to the $189 Marmot Minimalist. 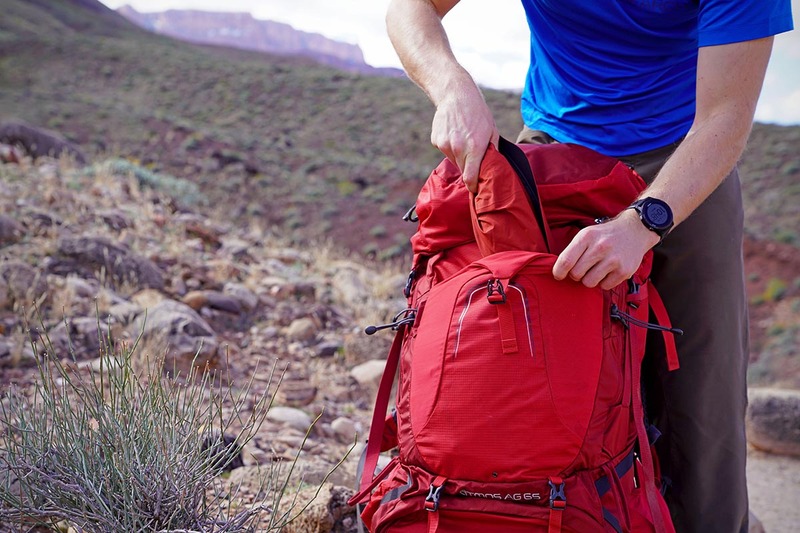 You get enough features and a substantial enough fabric to use to and from work, but they’re plenty light and packable to bring along on a hiking trip. And their performance in heavy rain and wind is admirable, particularly the more substantial Gore-Tex Paclite models (including the Marmot Minimalist, Outdoor Research Foray, and Black Diamond Liquid Point). Breathability does suffer compared with the performance shells below and the cheaper jackets won't last as long, but they are a nice middle ground of price and performance. Performance-oriented rain jackets are your focused outdoor pieces. One step down from a full-on hardshell jacket, they're made to withstand extreme conditions: the shell fabrics are tougher, the waterproof membranes are better breathers, and the hoods are more substantial. As a result, the interior fabrics are also much less prone to clamming up, and often have a premium, soft feel. Price does increase with these upgrades, although daily usability is nearly on par with the hiking/daily use category above. The primary compromise is pocket placement as some hand pockets sit high to accommodate a climbing harness or backpack hipbelt. Jackets in this category include the REI Co-op Drypoint GTX, which blew us away with its performance in brutal conditions in Patagonia. 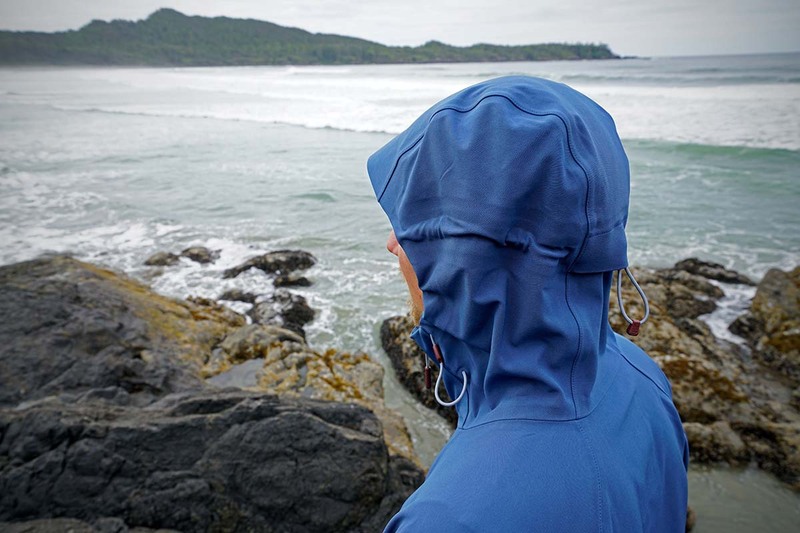 Pared down, thin, and very focused, ultralight rain jackets are not for everyone. Their performance is often similar to or a little below the weekend hiker category above. On the surface, that may not seem impressive, but given the substantial drop in weight, there’s a whole lot of technology packed into these 6-ounce (or less) wonders. The designs do require a few sacrifices, most notably the thinner fabrics being more prone to tearing and sagging and pressing against your skin under heavy rain. You also miss out on a number of features like hand pockets and as many adjustment options for the waist, hood, and wrists. All those sacrifices are well worth it for the ultralight backpacker or climber who needs an emergency shell. The rest may be better suited to look elsewhere. Thanks to advances in fabric and membrane technologies, there is a growing market of trail-running jackets that push weights even lower than the ultralight category above. Through some extensive testing, we've found these shells to be completely waterproof with seam taping and 3-layer membranes, and breathability performance exceeds their 2.5-layer counterparts (including the OR Helium II). Clearly, there are compromises in such a feathery structure and the most significant is durability. The class-leading Arc’teryx Norvan SL may weigh 4 ounces but its construction is so delicate that you can’t wear a pack without potentially damaging the waterproof system. Cost is another consideration as these jackets run about $300. For the trail runner that heads out in any and all conditions, however, the performance for the weight is simply unmatched. 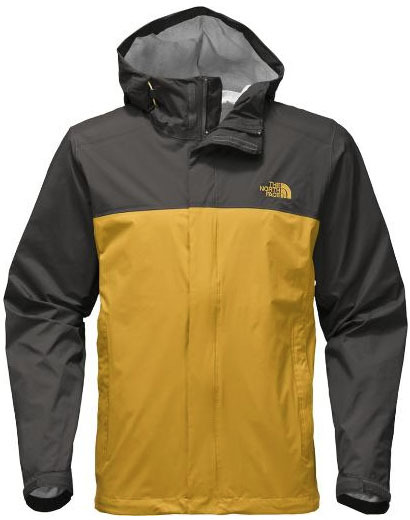 No piece of outdoor gear offers total protection from outside moisture, but most of today’s rain jackets are listed as being either “water resistant” or “waterproof.” Many light rain jackets, windbreakers, and soft shells are water resistant, meaning that they shed water in light to modest precipitation but aren’t completely waterproof under extended exposure. 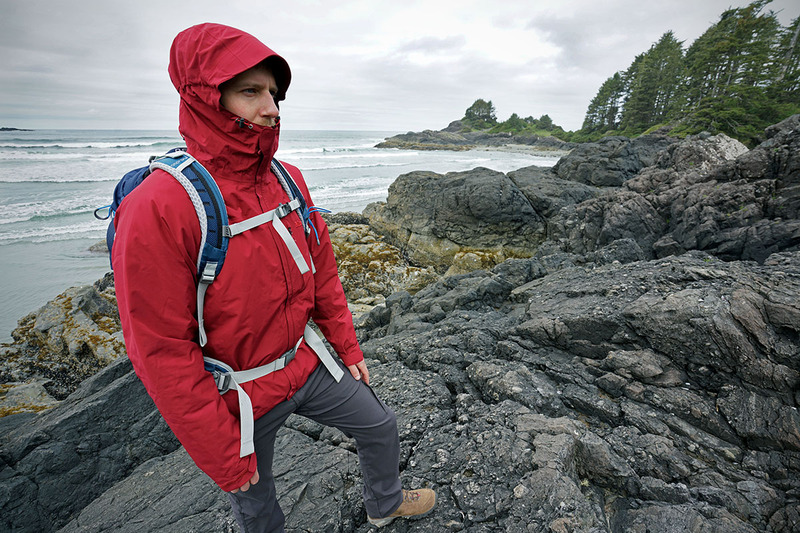 Waterproof jackets have a built-in laminate layer like Gore-Tex or a coating that essentially blocks outside moisture from entering under most conditions. Additionally, they have waterproof taping along the seams on the interior of the jacket. You may notice a waterproof rating listed on some outdoor gear websites, represented by a number from 0 to 20,000mm or more. This is the amount of water in a 1-inch-diameter vertical tube that the material can withstand without leaking. The test is a strange one: it doesn’t mimic real-world conditions and many manufacturers choose not to list it at all. Other factors like seam taping play a major role in waterproofness, so the number doesn’t truly determine how dry you will stay in a downpour. We at Switchback Travel don’t feel the waterproof ratings are very helpful in the buying process and have chosen not to list them with our specs. You can take note of the number when it’s available, as it will often correlate with other characteristics like fabric thickness and durability, but don’t base your buying decision on that alone. These jackets are the most basic, and typically require a mesh liner to protect the jacket’s inner coating (hence the 2-layer name). They’re not very breathable and the mesh adds bulk, making 2-layer jackets best for casual use. You’ll often find them in entry-level styles, such as the $59 Columbia Watertight II above. One notable exception is a jacket like the Arc’teryx Zeta SL that uses Gore-Tex’s new Paclite Plus, which has a minimalist, protective treatment on the interior in place of a hanging liner to minimize weight and bulk. The treatment is thinner than the sprayed-on coating of a 2.5-layer jacket (more on this below), so we consider the Zeta a 2-layer piece. A 2.5-layer jacket attaches a very thin interior fabric to the waterproof/breathable laminate or coating. The benefit of this interior finish is that the mesh found in 2-layer jackets is no longer necessary. Breathability as well as compressibility increases and weight decreases with the design, making this the most popular option for hikers, backpackers, and climbers. One downside is that the interior fabric isn't as soft to the touch as a true 3-layer (some consider it slippery or plasticky), but we've seen improvements with recent models. A true 3-layer construction incorporates three separate pieces of fabric, with the actual waterproof and breathable membrane in the middle and a more substantial fabric on the interior. This adds a bit of bulk than a comparable 2.5 layer, but increases durability and further improves moisture wicking and next-to-skin feel. Jumping to a 3-layer jacket also involves a significant increase in price, and most often these are big name designs, like Gore-Tex or eVent. It's worth noting that all premium performance jackets to make our list have a 3-layer construction. Hiking, backpacking, climbing, and other backcountry pursuits require a jacket that is lightweight but also can handle a sustained downpour. The differences in weight are significant: an ultra-lightweight minimalist shell like the Outdoor Research Helium II, for example, weighs only 6.4 ounces, while cheaper jackets or those with more features can weigh closer to a pound. Those extra ounces in a pack can really add up, making an ulralight shell a compelling option. Weights are continuing to drop as fabric and membrane technologies advance, and at the extreme end are sub-5 ounce trail-running jackets like the Arc'teryx Norvan SL. One of the most sought after features in a waterproof rain jacket is breathability: the ability for perspiration and other moisture to exit the jacket without outside water coming in. Some cheaper rain jackets are barely breathable at all, but almost all of the fabrics used in today’s models are at least somewhat breathable and promoted as such. The market leader has long been Gore-Tex, particularly in their high-end offerings, but a number of fabrics are now challenging the paradigm including eVent, NeoShell by Polartec, MemBrain by Marmot, and HyVent Alpha by The North Face. Generally speaking, the more you spend the more breathable the jacket will be. One exception is ultralight jackets, which cost more than cheap lightweight models but ventilate approximately the same in most cases. A jacket’s breathability is greatly enhanced with the inclusion of pit zips, which we discuss further below. A jacket’s packability can be looked at and measured in a couple ways. First, there are the jackets that can stuff into their own pockets. Just turn the pocket inside out, smoosh the jacket in, and zip it shut. While this is great, it’s doesn’t necessarily mean the jacket is that packable. The packed sizes can vary widely for these “packable” shells, with the ultralights resembling a small envelope and others, like the cheaper Columbia Watertight, measuring about 3x the size. The other way of looking at packable rain shells is how compressible they truly are. In that respect, the lightweight Arc'teryx Zeta SL would still be considered quite “packable”, despite lacking a stuff pocket. You can just roll it up into its own hood to protect the thinner fabric in your pack. Look to weight as a great indicator of how packable a jacket truly is. 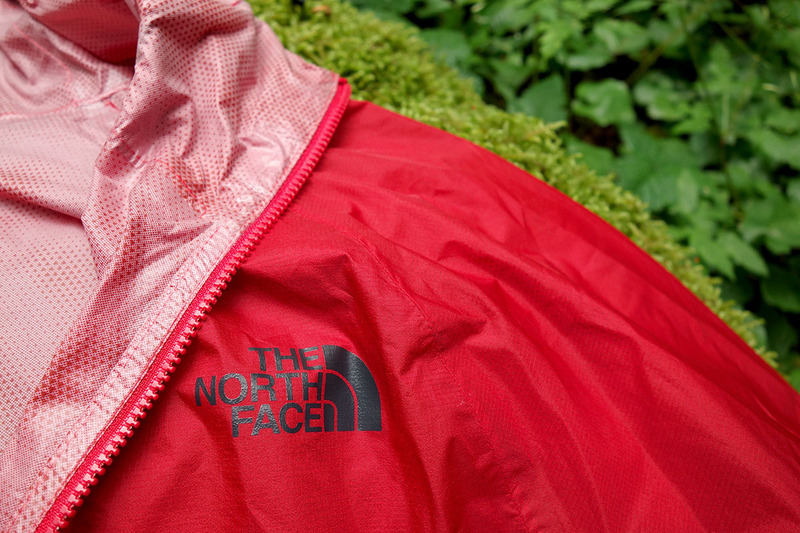 Rain jackets don’t offer as much variation in features as some other types of outdoor gear, but there are notable differences between models. Many ultralight and trail-running jackets forego pockets to cut down on weight, while other models sport them in abundance. Some rain jackets offer pit zips and/or full side vents, while basic models do not (as well as taped seams on more expensive rain jackets for extra protection from the elements). Almost all rain jackets have hoods included, but some are cut big enough to fit over a helmet and the style of the cinch varies significantly. Keep a close eye on features and try to match them to your intended use and budget. Casual users appreciate a couple of hand pockets, and that’s one of the most notable omissions in using an ultralight shell for daily use. 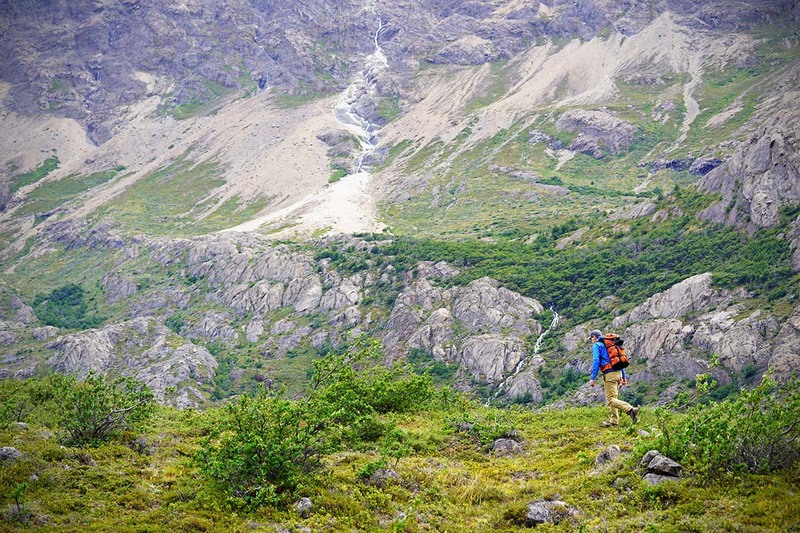 Most ultralight shells go without hand pockets, instead opting for a chest pocket for storage. On the otherhand, more feature rich shells, such as our hiking/daily use options, hit a better sweet spot for the everyday user. You often get two hand pockets and a chest pocket (either on the inside or outside of the shell), all the better for the little things you need to carry around on a daily basis like a phone or wallet. Pocket placement is another consideration. Serious shells, such as those offered by Arc’teryx, often place the hand pockets higher up on the torso to avoid interfering with your pack’s hipbelts. What you gain in convenience with the hipbelt (or climbing harness), you then lose in daily usability. It’s just not as natural a landing spot for your hands. Hood size can be a big consideration when rain jacket shopping. If you plan to climb in your rain jacket, look for one with a helmet compatible hood. These can reach over the top of most climbing helmets for added weather protection. For example, Patagonia's Stretch Rainshadow is a great choice for climbers due to its large hood as well as its tiny packed size that can be easily clipped to a carabiner. For normal hiking and backpacking, it’s often prudent to avoid this feature as the large hood will require a lot of cinching down, causing the fabrics to bunch up. Adjustability of the hood also is key. When the wind is blowing, you want a hood that conforms to your head, while retaining enough structure around the sides and the bill that you can still see out. Some manufacturers succeed better than others at this concept. One standout is Arc’teryx’s StormHood: with a single pull at the back of the hood, you adjust evenly around the sides and back of the head. Of the more budget-friendly options, we like the hood design of the Patagonia Torrentshell, which has toggles at the back and front for quick and easy adjustments. We prefer the toggle style for adjusting the back of the hood over a rip-and-stick Velcro tab for its improved performance (both styles are pictured below). The cord wraps around the sides of your head and pins the fabric down in a uniform way when cinched, which keeps the hood on your head even in really windy conditions. The benefits of the Velcro style are simplicity and weight: they don’t require a cord or toggle, both of which add a bit of bulk. In creating a waterproof jacket specifically designed to keep moisture out, there are natural restrictions on the air being held inside. And when you’re working hard, it can quickly become a necessity to dump some of that hot air rather quickly. Enter the pit zip. By opening up the jacket under the arms, you can release a lot of air without sacrificing the jacket’s waterproof design. The ultimate expression of how effective a pit zip can be is the Outdoor Research Foray. The underarm zippers extend all the way down to the hems on either side. Full unzipped, the jacket becomes a poncho. To give the best seal possible, every rain jacket that we recommend here has some sort of cinch system at the hem. Typically done with a cord and toggle, they’re very user-friendly. You’ll see one side cinch on ultralights when the manufacturer is trying to cut some weight. The single cinch does mean if you really have to tighten the jacket, it will pull a bit to one side, but it’s often negligible and worth the weight savings. Heavier rain jackets have cinches on each side for a more even fit. Over the past few years, there have been a growing number of waterproof rain jackets featuring built-in stretch. Designs like Outdoor Research’s Interstellar and Black Diamond’s StormLine and FineLine incorporate fabrics and a waterproof internal membrane that flex surprisingly easily. For performance use, the benefits are obvious: while climbing, hiking, or other activities where you’re moving your arms a lot, a stretchy jacket is less restrictive. But we’ve also enjoyed the greater level of comfort and less crinkly feel for daily wear. In general, a stretchy rain jacket will cost more than a standard shell (for example, the BD StormLine is $149 compared with the $100 Marmot PreCip), but it’s a nice upgrade that comes with plenty of tangible benefits. What About Softshells and Hardshells? Traditional softshell jackets are not fully waterproof. While the outer fabric typically has a DWR coating, letting light showers bead up and roll off, the seams aren’t taped and the fabric will eventually let water seep through. Also, a softshell is a bit thicker than a rain jacket, and offers a negligible amount of warmth as a result. Even as technologies have advanced and full waterproof softshells have become available, they still can’t compete with the waterproofing performance of a traditional rain jacket. Instead, softshells remain a better choice for those looking for a breathable and water resistant outer layer. Popular applications include backcountry skiing and trekking in mild weather. For a list of our top picks, you can check out our in-depth softshell review. Hardshell jackets, in contrast to the hiking rain jackets we’ve listed above, are made for truly extreme conditions. 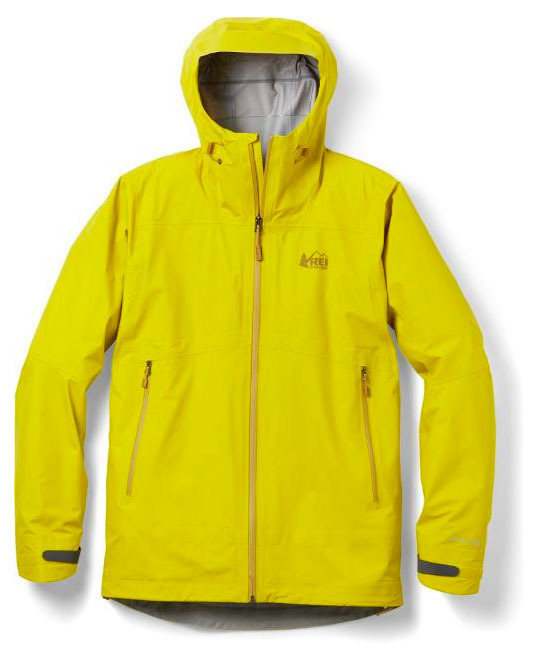 Built to withstand heavy driving rain and wind, the jackets are heavier and bulkier. Their fabrics are also much less prone to being soaked through under sustained rainfall. As a result of the tough builds, you’ll see these hardshells being used for anything from mountaineering to backcountry skiing. And you’ll also see prices skyrocket for these performance pieces thanks to their high-end detailing. 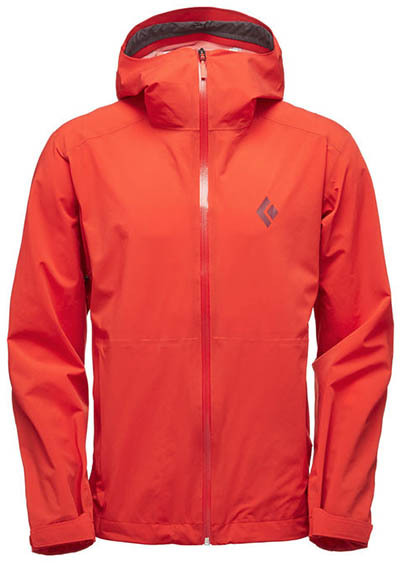 A couple rain jackets on this list cross into the lighter end of the hardshell category, including the Outdoor Research Interstellar and REI Co-op Drypoint. More hybrid hardshell/softshell options are being released each year. It's increasingly easy to find softshell jackets offering ever-improving wet-weather performance and hardshell jackets incorporating softshell panels for better range of motion, comfort, and breathability. For more reading on this somewhat confusing topic, we've found this article by Outdoor Research to be a nice summary of the current state of the market. 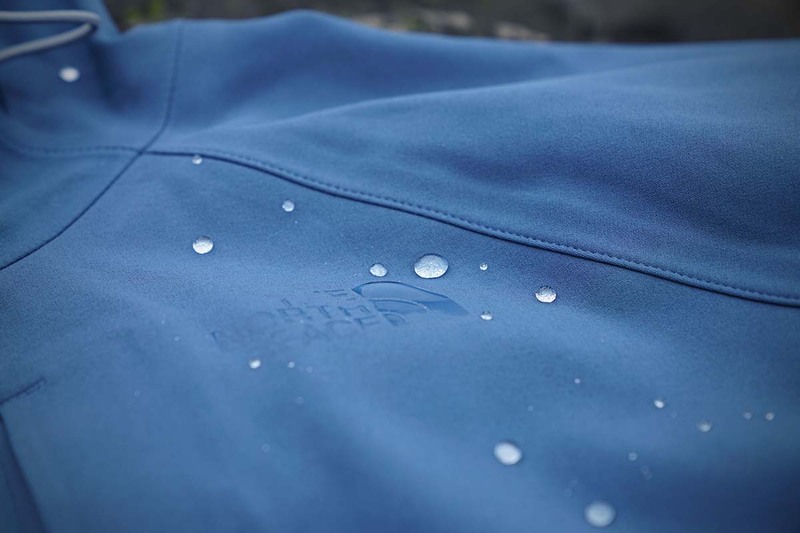 A rain jacket’s waterproofing relies on a combination of factors: Durable Water Repellent (DWR) coating that beads up water, and clean fabric layers on either side of the waterproof and breathable membrane to allow air vapor to pass through. Some membrane designs are more vulnerable to getting clogged up and require consistent cleaning (this will vary based on use, but we aim for every few weeks with our eVent direct venting gear). For washing, it’s always best to start by checking the label on your jacket as the specific instructions will vary. As a general recommendation, the following works well for us: wash the jacket in warm water with liquid detergent, and run it through a second rinse cycle to clear out any detergent residue. Line drying typically is best, although we’ve had some eVent and Gore-Tex jackets that instruct you to put it in the dryer on warm heat to replenish the DWR finish. If you’re noticing that the jacket isn’t beading up water anymore and putting it in the dryer for a short stretch doesn’t fix the problem, you may need to reapply some DWR (this is common as the coating diminishes over time). A waterproof jacket without DWR won’t breathe as well in heavy rain because the water will pool up and soak into the exterior fabric layer. Reapplying the DWR is done through a fairly simple process, and we’ve found that the Nikwax TX.Direct Spray-On works well.